Update: XNA Magic has been renamed to Blade3D due to copyright issues. “XNA Magic is the first all-in-one game development system designed from the ground up to take full advantage of the brand new Microsoft XNA platform. Opening their website just a couple of days ago, XNA Magic offers a preview of a yet another video game development platform, building on top of the Microsoft’s XNA framework. In concept, it is similar to the Torque X engine. Though the XNA Magic’s focus appears to be full out 3D worlds and effects. Galleries – “The XNA Magic development environment provides easy to use gallery based editors.” Meaning to say presets available to objects and environments. Scripting – Object or Class level C# behaviour scripting. 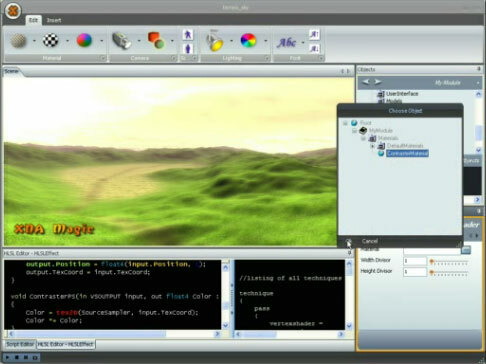 Shaders – “XNA Magic development environment provides a great HLSL editor for editing your shader code.” A number of pre-made effects are included out of the box. The system is still in development, though so far it looks promising. The pricing is not yet known, but it is suggested that there will be multiple versions or licensing options to fit smaller budgets. For now, those interested in developing 3D worlds for their XNA video games, can register to receive XNA Magic Beta One – due out this Febuary. If this works as well as it looks and sounds, this seems to be an amazing solution for aspiring game programmers. Depending on the price when it comes out, I may give it a shot and see how it works.